Bilateral Development Banks (BDBs) – to NDCs and possible solutions to overcome these barriers. The findings of this study show that NDCs are not inherently designed as portfolios of bankable investment projects. The paper also explores the needs to create standard mechanisms for tracking NDC progress and innovative solutions to address them. 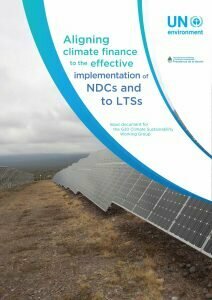 Mainstreaming NDC-aligned finance into global financial systems can align to both countries’ priorities and the Paris Agreement goals. As a result, when financial systems align to the Paris Agreement, they can inherently also align to the 2030 Agenda, and promote sustainable development. A certain degree of systemic change across stakeholder approaches would be needed however for these solutions to become prevalent.